The rare breeding birds have chosen to nest close to the ground that was due to be worked over the summer, leading to an intervention from the Aggregate Industries team, with the quarry manager changing the direction of extraction and works in order to ensure the nest remained safe and undisturbed, while a local birdwatcher also monitored the nest from a nearby footpath. In addition, only one youngster survived from the first brood, the quarry’s treasured temporary residents choose to have a second brood meaning their stay lasted far longer than expected before eventually returning to Africa for winter. 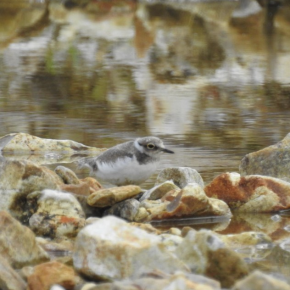 However, two youngsters fledged the nest successfully in late summer and quarry operations were able to return to normal.